Within Teamwork Projects, you can add triggers to columns in your project board view to automatically change properties when a card is moved to that column. Note: Board view triggers are available on paid Teamwork Projects plans. For example, you can set up a column called "Finished" and add a trigger so that any cards moved to that column will automatically be completed. To add a trigger, hover over the column name to reveal the options dropdown, and click to show the menu options. Select Column Settings. 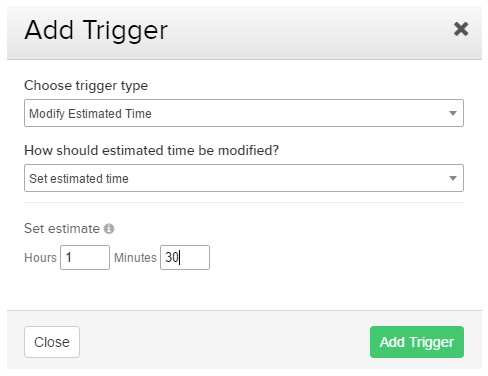 Use the Add Trigger button and choose what kind of trigger you would like to create. Notify Assignees - when a card is moved to a column with the notify trigger set, an email will be sent to the user(s) assigned to the task notifying them that the task has been edited. Choose whether to replace any current assignees or add/remove assignees, then select them from the list. Note: You can also choose 'User moving the card' rather than selecting a specific person at this stage. The auto complete option means that when you move a card to that column, it will automatically be marked complete. You can update the start date, end date, or both. Example: If the original date is March 1st and you use "Push due date: 2 days", no matter when you move the card into the column, the new due date will be March 3rd. Note: If there's no due date, the new date will be the date you move the card into the column plus the push value. Current day - sets the date on the card to the date you move the card into the column. Example: Regardless of the original date on the card, if you move the card on March 1st, the new date will be March 1st. Current day +1 / +2 / +3 ... +14 - sets the date to the date you move the card into the column plus the value you choose. Example:, if you choose "Current day +2" and move the card on March 5th, the new date will be March 7th. If you move the card on March 7th, the new date will be March 9th. This trigger will affect cards being moved to the column as well as existing cards, if they are marked as complete. 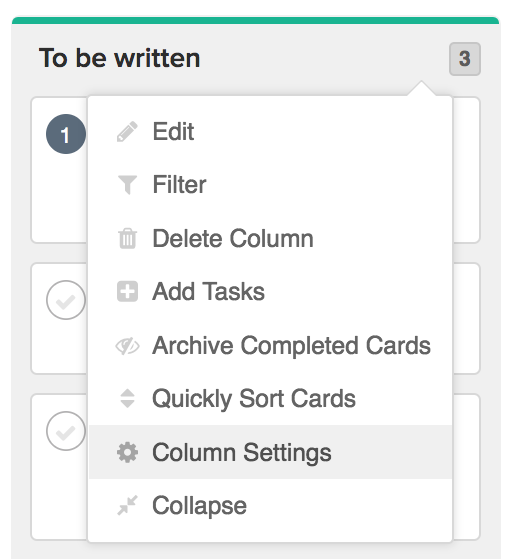 With the modify task list trigger, you can set cards to move to a different public task list in the project automatically, once they are placed in the board column. You can choose one of your active or completed task lists as the new task list for the card. 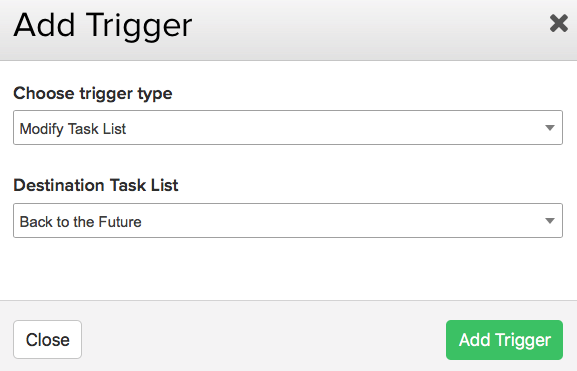 Note: The modify task list trigger will override any default task list that is set. 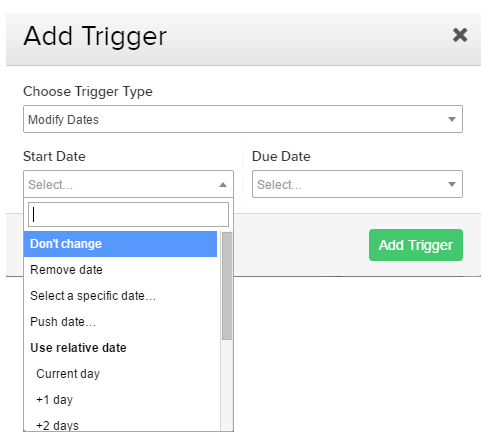 Once you've added the trigger you'll see it listed in the column settings area where you can edit or delete it. You can quickly see what triggers are set on a column by hovering over the icon in the bottom right of the column. You can add multiple triggers to a column, and they will all be applied when you move a card to that column.